Charles Robb and Courtney Pedersen’s A Natural History of Trees is a meditation on the materiality of wood and the raft of associations that it conducts. Taking the form of a pine panelled room containing a pair of life-sized tree trunks composed entirely of stacks of cut paper, the installation is simultaneously a response to the complexity of our relationship with nature and place, and an evocation of the precarious quality of the collaborative process. In the collaborative practice between Charles Robb and Courtney Pedersen we stumble into environments that fuse the brittle harshness of the Nordic climate with the cosiness of Scandinavian interiors. Here, two silver birch trees tower precariously within the gallery space. 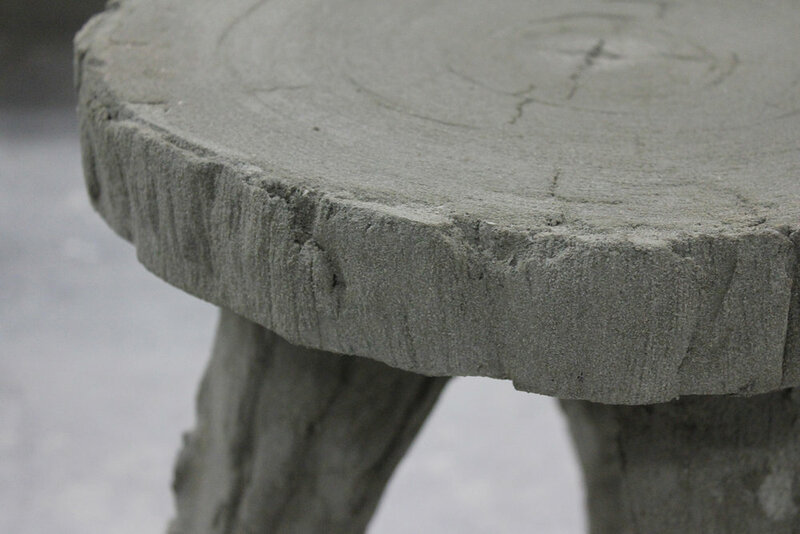 Nearby, a small faux bois concrete stool sits poised as a platform for our contemplation of the trees. The gallery walls, clad in rough hewn pine, form a protective enclosure around the objects, suggesting the atmosphere of a sauna. There is an immediate conflict between our familiar expectations of internal and external realms. Was by the Northern Coast, exhibited by the artists in 2011, explored the ferocity of nature through the evocation of a shipwreck mounted upon a platform of snow-laden battens. These natural elements – snow, and now birch trees, are represented through the witty use of man-made materials. For snow, the artists chose the white fluffy filling normally reserved for domestic insulation. 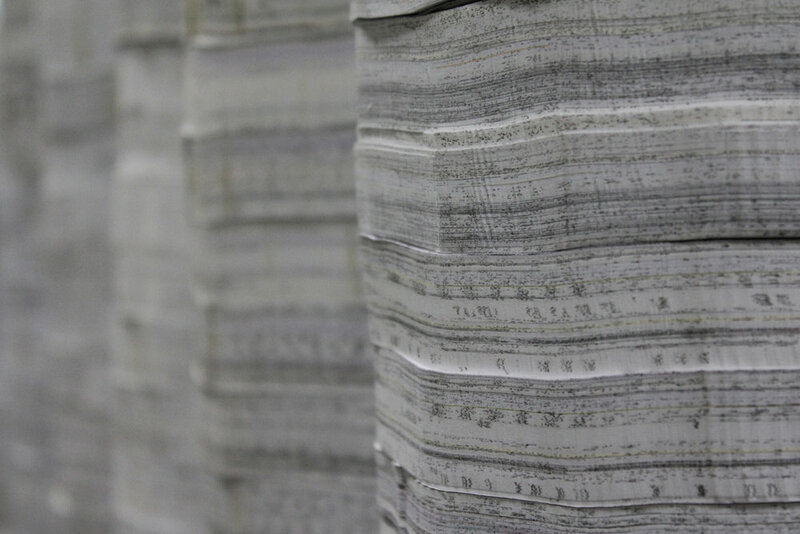 Here, the artists have stacked discs of discarded photocopy paper to create replicas of life- sized birch trees. Although painstaking,1 this process reveals some happy resonances with the silver birch. 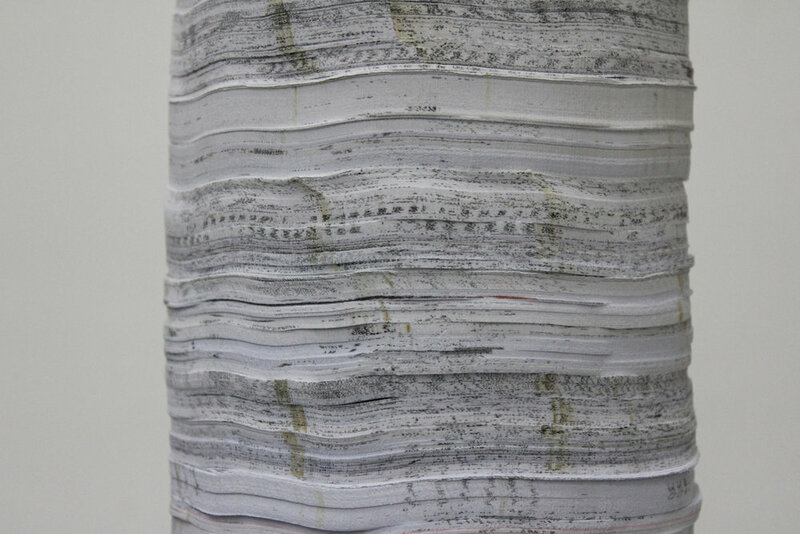 The small black flecks of ink that coat the surface coupled with burn marks from an industrial bandsaw enhance the ‘natural look’ of the tree. The inclusion of a faux bois stool modelled in concrete, and a wood-panelled wall made from undressed pine fence palings, lead us to realise that replication is not the point here. Rather, the exhibition is a celebration of inauthenticity, an acknowledgement of the essential foolhardiness of trying to re-create an object or an atmosphere that can never quite be replicated. By extension, the exhibition evokes the cultural moment of assimilation – something we might encounter walking into a Scandinavian Club in Australia, for example – where an attempt to re- create the cultural atmosphere in an environment that is far removed is often carried out with a wistful sense of resignation. The artists describe the installation as ‘a meditation on the ways in which in order to make some alien place home, we try to find approximations of where we’ve come from, and because of that displacement, they’ll never be authentic, there’ll always be concessions.’2 All too often, such attempts to order the world in such a way as to make it familiar, succeed only in making it all the more alien. We might see this project in direct opposition to the initial values of the land art movement: an artistic protest against the perceived artificiality in aesthetics in favour of a return to nature. In this artificial landscape there is an inverse scenario of natural contemplation – after all, it is only the pine-clad walls, employed as an atmospheric armature for the installation, which possess any natural qualities. Instead of the more bombastic land art interventions, where entire trunks of trees spill into galleries, this is a more tentative approach to the natural world, and one that gently asserts, as humans in communion with nature, that we can’t see the forest for the trees.